Enjoy a hearty bowl of beef stew. Make it in your slow cooker (aka crock-pot). Let the aroma of this delicious dish fill your home and your tummy when you get home from work! Please take a moment to read the note at the bottom of the page regarding adding more stock – if you have to leave this dish unattended during the day. 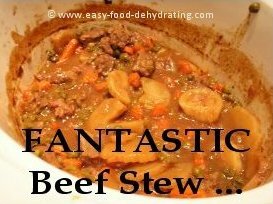 This beef stew contains dehydrated onions, carrots, potatoes, celery and garlic. You don't need to re-hydrate the veggies prior to slow-cooking. This beef stew is made in a slow-cooker – how easy is that? 1. 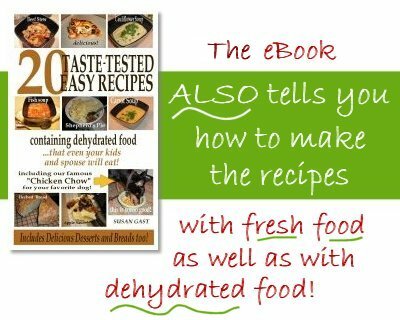 Put the dehydrated items and seasonings in your crock-pot. 2. Prepare 3 cups beef stock in a large jug. Add the Worcestershire Sauce, ketchup, and optional tomato paste. Stir to dissolve the ketchup. 3. 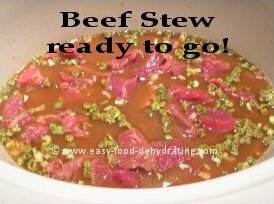 In a separate jug, measure 1/4 cup of cold water, add the flour, stir well then add this to the beef stock and Worcestershire Sauce and ketchup mix. Stir well. 4. Add the stock mix to the slow cooker (let it cool a bit so you don't shock your crock(pot)! 5. Add the stewing beef. Stir gently to mix all. Cover with crock-pot lid. 6. Turn on the slow cooker ... low heat, 4 - 6 hours. When You Return Home from Work ... It's Ready to Eat and Serve! 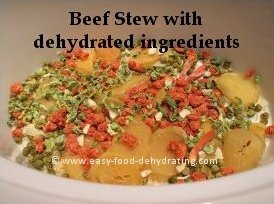 This is what your beef stew will look like with the dehydrated ingredients. Here's your stew-to-be; with added beef and stock! And when you get home from work, you'll lift the lid to discover a super-satisfying stew. You can see how much the stock/water level reduced to make the thick gravy; that's why it's important to make sure you do add enough stock in the first place!